A few months ago I chanced on this masterwork in an exhibition in the Art Museum in Basel with works from the Prado. It is one of those pictures that exert fascination at first sight. The observer notices at once that an important statement is being made here. But what statement? When one studies the picture more closely, it presents a number of questions: why is a painter standing there alone in front of the cross? Where is Mary and where are all the other people who are depicted in every crucifixion scene? Why is Christ smaller in relation to the painter? Why is no wound visible in his side or blood on his feet? Why is there no picture to be seen on which the painter is working? Only one answer is really possible here: this crucifixion scene is itself the picture the painter is working on. The unused red on the palate and the brush suggest that his next step is to give Christ his wounds, the wounds that are still missing in the picture. The painting thus goes far beyond a mere representation of the crucifixion of Christ. It speaks about the artist himself. And indirectly it puts a question to the observer: how about you, do you also see yourself as one of the culprits or do you stay at a refined, perhaps aesthetic distance, from the crucified Christ? In my opinion this work manages to bring about a direct connection between art and the reality of faith. 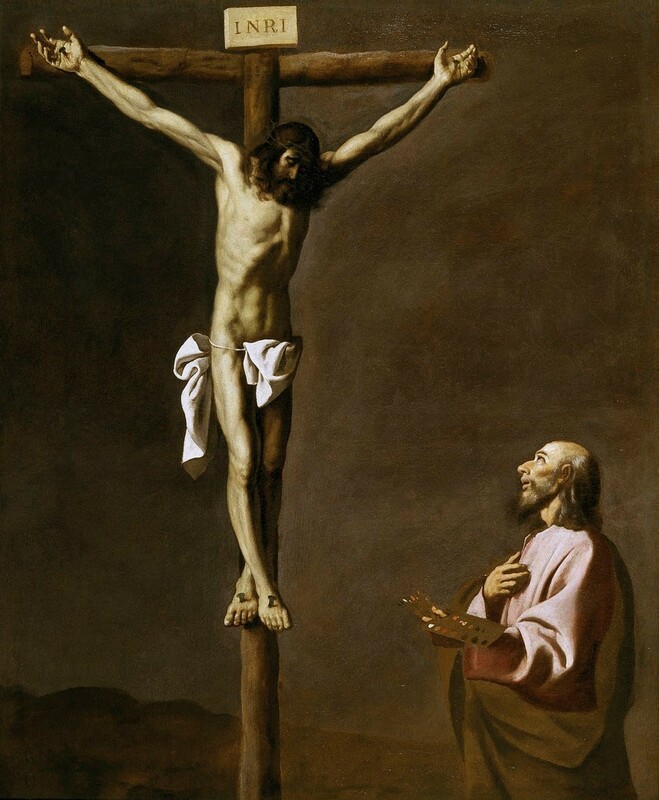 Francisco de Zurbaran: The Crucified Christ and a Painter, c. 1650, oil on canvas, 105 x 84 cm. Museo del Prado, Madrid, Spain. Francisco de Zurbarán (1598-1664). Aside from producing a number of history paintings, portraits and still lifes, the Spanish Baroque painter Francisco de Zurbarán devoted his career almost entirely to religious works. Due to his preference for chiaroscuro his style was often compared to that of Caravaggio. The artist’s favorite subjects were religious figures – apostles, saints, monks and madonnas – posed against neutral backgrounds. Zurbarán paid particular attention to the natural effect of lighting and the details of dress. He was applauded for his ability to combine realism with mysticism, bringing a degree of accessibility to spiritual otherworldliness. Beat Rink was born in Basel, Switzerland. He has two Master degrees from the University of Basel in literature/history and theology and is an ordained pastor of the Swiss Reformed Church. He co-founded Crescendo (www.crescendo.org) and Arts+ (www.artsplus.ch). He works as a full-time leader of Crescendo international. He gives lectures and has written several books. To read an article by Beat Rink about Christianity and art, click here. This meditation was first published as TUNE IN 249. The TUNE INs are weekly spiritual reflections for artists in English and German, published by Crescendo, which can be ordered here for free or go to Facebook.